Ever since I started dyeing my blonde hair dark brown, I've been looking for shampoos and conditioners that would help maintain the life of my colour. Lately I've been trying out Joico's Color Endure Sulfate-Free Shampoo & Conditioner*, which claim to be gentle enough for daily use. I love the idea of using sulfate-free products since my scalp can be a bit sensitive at times. 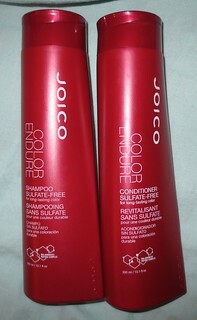 Joico's Color Endure Sulfate-Free Shampoo is a very gentle shampoo formula. Since this is a sulfate-free formula, it doesn't have a big lather like traditional shampoos. At first, you might miss this lathering, but it definitely isn't necessary to get your hair clean. If you colour your hair, looking into a gentle, sulfate-free shampoo formula is a great idea. I find that this formula does a great job cleansing my hair, and removing excess oils. The sulfate-free formula is really gentle and hasn't been irritating my scalp at all, which is a major bonus. These products have a very mild scent to them, which just reminds me of a traditional shampoo scent. "Gentle cleanser for color-treated hair that increases color longevity and reduces tonal change. Joico's Color Endure Sulfate-Free Conditioner is a very light-weight formula. I typically like a heavier conditioner for my hair, since my hair is very dry and damaged. I think that this conditioner would be great for anyone with fine, thin hair, but I do like something a bit thicker for myself. This formula is very gentle, so it is great for colour treated hair, just as it claims. Nice review make me want to buy it. I definitely have thinner hair so these sound great! Hmm I have quite dry hair, so I don't think this line is for me. But I do love their K Pak line!